Several hundreds of people gathered in the small town of Heiligerlee in the Dutch province of Groningen on May 23, to remember the fact that it was exactly 450 years ago that the Battle of Heiligerlee took place. At the same time, an exhibition about portraits of the Dutch Royal family was opened. For these portraits, display board from Solidus Solutions has been used. The Eighty Years’ War started in Heiligerlee and as such, this is the birthplace of The Netherlands. During this battle, the House of Oranje-Nassau (Orange-Nassau) got irreversibly tied to The Netherlands and its people. Counts Lodewijk and Adolf van Nassau, brothers of Prince Willem van Oranje-Nassau (William of Orange-Nassau), fought together with the state army against the Spaniards. Count Adolf died during this famous battle. 450 years later we remembered this battle. The invitees were welcomed in the museums of Heiligerlee, which are the Battle of Heiligerlee Museum and the Bell Foundry Museum. Governor of the King (each Dutch province has a representative of the King) René Paas opened the exhibition on Dutch Warfare in the museum. After that, the invitees accompanied a bell, which was founded the evening before in the garden of the Bell Foundry Museum, to the monument of Count Adolf. Here, Anne Marie Knottnerus, chairwoman of the organisation committee, the Governor of the King, deputy mayor Laura Broekhuizen and poet Sky Bakker held some speeches. After the ceremony at the monument, the invitees walked to Estate Westerlee. Here, the Commissioner of the King opened the exhibition of Royal portraits “From William of Orange to Princess Amalia”. The exhibition shows portraits of 19 people from 14 generations of the House of Orange-Nassau. The Royal House Archives in Den Haag made the portraits available and they were printed by America Digitaal, a company from the city of Leiden. 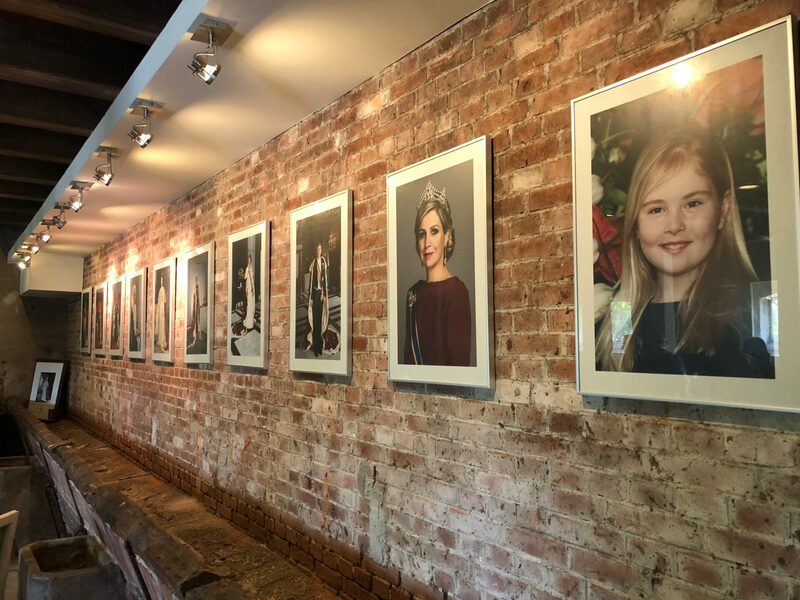 They used the new Displayline 2/s premium from Solidus Solutions to show the royal portraits in their very best way.